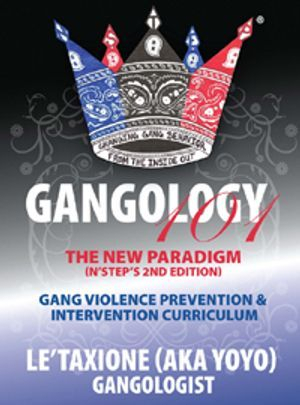 N'STEP® Gangology 101 defines a new paradigm for considering the issues related to destructive gang behavior; it walks the student through 9 critical elements of life and society which affects and is affected by the violent gang mentality. Each step is geared generally toward enlightening the student on the 9 elements and focuses specifically on how they play themselves out within the gang experience. By considering these elements the student increases his/her understanding of themselves, others and society in general and broadens their thinking and their decision making abilities even within the Structural Gang Culture. N'STEP® Gangology 101 and its new paradigm are derived from the recognized need to embrace the gang banger as part of the solution and the legitimacy of the gang culture. It provides an honorable basis for Changing Gang Behavior From The Inside Out®.